In Nigeria, finger foods are popularly referred to as small chops. Back in the day, these were limited to Battered Fish, Mini Sausage Rolls, Snails, Peppered Gizzards, Barbecued Goat Meats (Asun), Puff Puffs and the like. But these days, some imported world recipes have joined the Nigerian Small Chops family, including samosa. 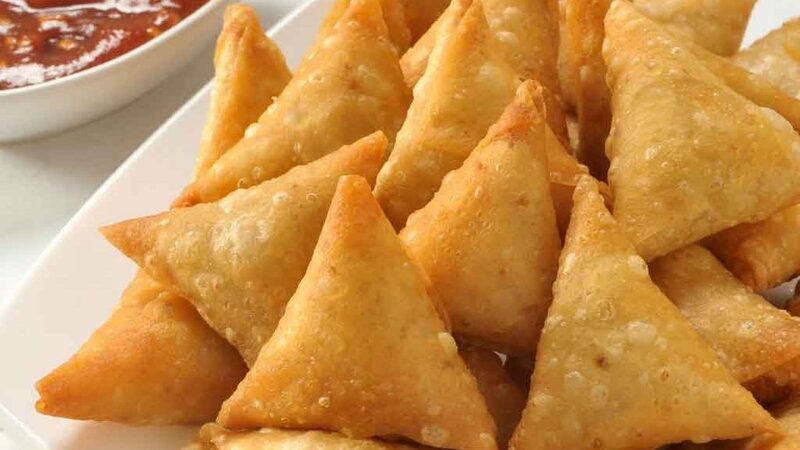 A samosa is a fried or baked dish with a savoury filling, such as spiced potatoes, onions, peas, lentils, macaroni, noodles, cheese, minced lamb or minced beef. It is typically in a triangular shape. Samosa is an Indian delicacy but Nigerians love it so much! It is now a constant feature at every party, and is usually the first thing to finish. With this recipe, you do not have to wait for an owambe party to eat this delicious snack. You can always make it at home and eat to your fill. Wash and peel the irish potatoes and carrots. Dice into tiny bits, add green peas. Add a little salt and cook for about 5 minutes. Take off the heat once the get soft and set aside. Slice onions in circles. Set aside. Heat up vegetable oil in a small pot, add the onions, curry and garlic powder, and stir for a few seconds. Add the minced meat and stir-fry until it turns to a pale colour. Add stock cubes, pepper and salt to taste. Add the cooked vegetables and mix together on medium head for about 3 minutes. Pour flour into a medium mixing bowl. Add warm water, salt and vegetable oil. Mix until you have a smooth, stretchy dough. Cover mixture with an airtight plastic wrap and leave to breathe for 15 minutes, then knead the dough to make it more stretchy. Use a rolling pin to roll out the dough to a thickness of about 2-3mm. Cut the dough in circles. You can use the tip of a round glass bowl if you do not have a circular dough cutter. Cut those circles in two equal halves and smudge water on the straight part of the semi-circular dough. Don’t close it yet. Put a spoonful of the filling into the dough. Repeat until all the dough is finished.Heat up vegetable oil in medium heat. Make sure the oil is not too hot for it. Fry until the colour changes to light brown. Place the fried samosa on a paper towel to drain off excess oil.